Ralph - Can I count you in for any other PA restaurants that are added? The Nittany Lion Inn will be added soon and I'm waiting for others to be identified by someone with local knowledge. The Greenbriar resort in White Sulphur Springs, West Virginia was long a Duncan Hines destination. It still has its elegance to this day, although since the 1930s they have added a few more restaurants to the complex. Now there is a place I would love to go to for a weekend. Unfortunately I'd either have to hit the lottery or take out a loan on the cats so I guess it ain't happenin. It is indeed the lap of luxury. I guess Duncan could afford it. I'm certainly interested, but it may take me a while to get to more eastern ones. The General Denver hotel in Wilmington, Ohio was on a list from this book I found on someone's blog. The hotel has gone through bankruptcy, closure and resale over the years, so there is absolutely no DNA from the 1930s here - it's just the building with the name. The restaurant is just OK and can't decide if it's a local yokel sports bar or a semi-upscale dining establishment. And it doesn't do very well at either IMO. The last time we ate here two years ago we had to sit on the patio next to a 120db air conditioner compressor and my burger was grey. The pattern I'm observing with people's comments here on most places that survived (at least in name) is that the restaurants over the years tend to get too much self importance and raise their prices. They seem to become tourist traps. A traveling salesman today (if the breed even exists any more) wouldn't bother with a Golden Lamb (too stuffy, slow and overpriced) or a General Denver (not very good in general). I really like your response. There is a lot I agree with there. Part of what I hope we can do here is to find out which of the DH recommended restaurants that remain have turned to rubbish, and which are still exceptional. $20+ for a glorified turkey sandwich is more than I can imagine paying, but the prices at many of the remaining places, while high, are in line with what I expect to be charged at a nice restaurant in 2016. I found The Copper Queen Hotel in Bisbee, Arizona, which Duncan Hines said, "Without a doubt, the best place to eat for many miles." Looks like it might live up to that reputation. Here's one in Arizona that Duncan Hines recommended in his 1942 guidebook. It seems to be a mixed bag. Colorful. Maybe eccentric decor. Reviews are all over the place. It's the Monte Vista Hotel in Flagstaff, Arizona. I couldn't find a website, but these pictures will give you an idea of what to expect. Louis is in possession of a copy of the original list of restaurant recommendations that Duncan Hines sent with his Christmas cards in 1935. Because of many requests for the list, Duncan decided to produce a book of his recommendations - Adventures in Good Eating. Louis was kind enough to transcribe the list and send it to me. There were 8 Wisconsin eateries on the original list. Here’s what I know of them. 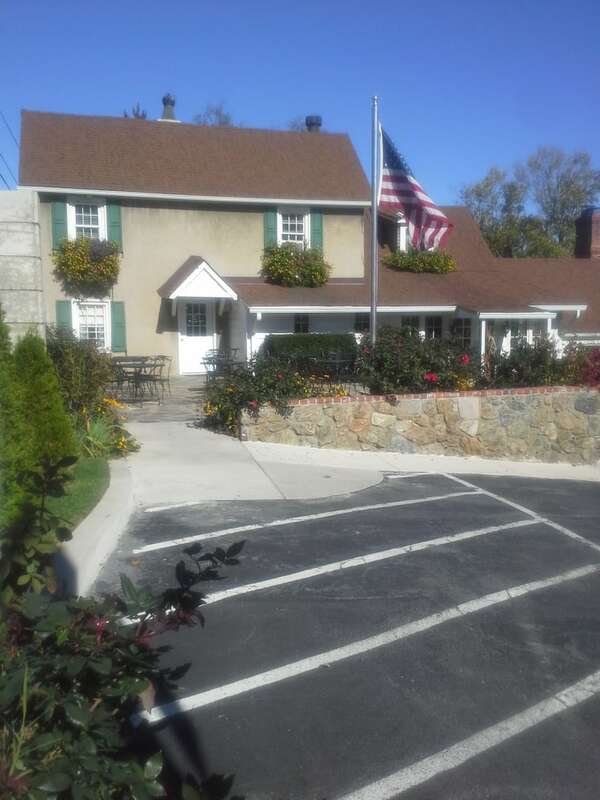 Mader’s and The Red Circle Inn remain open and offer excellent food and service. They would remain “Recommended by Duncan Hines” today in my opinion. Elkhorn’s Landmark, Madison’s Stidgers, and Oshkosh’s Steins are all apparently defunct. Steins Shop was a department store with several “Tea Rooms’ as part of the business. 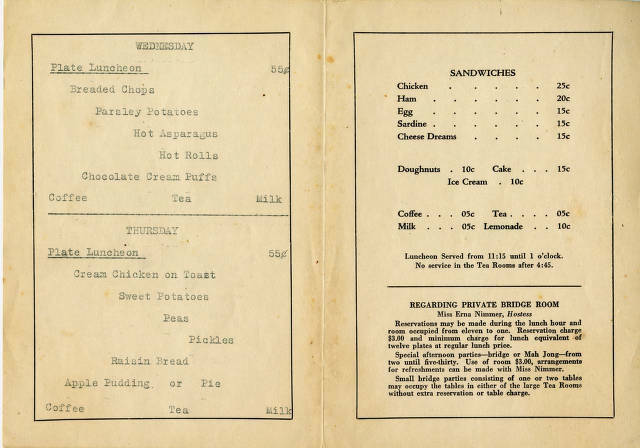 Here is a menu I found from them. The final two restaurants are only 10 miles apart in the utter boondocks of Northeastern Wisconsin. I can’t imagine what brought Duncan to spend time in this area. The Old Hotel in Cooperstown was destroyed by fire in the 1930’s, with only its stone skeleton left standing. It was reputed to be haunted. The remains of the building were destroyed by a windstorm in 2014. The final Wisconsin entry simply said: “Stangelville - Near Green Bay, Wisconsin, make inquiry.” This confused Louis and he wrote “Beats me what the restaurant is; maybe it was the only one there.” He asked the right question. It is the only one there. There is nothing else in Stangelville other than Konop’s Meat Market. Konop’s is still famous for their sausage, especially their wieners. I know from his biography that Duncan was known to drive far out of his way for the chance to purchase good sausage. Maybe Stangelville was for two-fer for him in those days. You cannot miss that hotel if you stay in Flagstaff. I think it was originally near a railroad stop and may currently be a boutique hotel. I think Pie Diva and I may have stayed there. Actually, I am pretty sure we stayed there. Our room was directly above the noisy bar and we had to go out to find a place for breakfast. The Lodge on the Desert in Tucson, Arizona was in his guidebooks. He wrote of it, "A pleasant, rambling, Mexican-type, relaxing place to which many like to drive for meals served as in a fine home. Care is taken with the cuisine." They don't have a website, but these pictures should give you somewhat of an idea of what's there. What reviews I've found say that the food is mediocre. It would be nice to have someone who lived nearby dine there (take a bullet for the team) and find out for sure. Elkhorn’s Landmark, Madison’s Stidgers, and Oshkosh’s Steins are all apparently defunct. Do you have an address for Landmark? I'm wondering if it was where Elk Restaurant is now, as the building has housed a restaurant for many years. No addresses were included on the list. We go to Mrs. Ks Toll House a couple of times a year. The place is lovely; both inside and out in back in the gardens. We go for the "Happy Hour" which I am certain that Duncan Hines never heard of and we go for dinner. The food is really excellent. I am sure that Duncan would have agreed to that. We have head that the Sunday buffet is just wonderful and a real bargain for this area but I don't "do buffets", so can't comment on them. Here is a picture from their website of the outside. The inside is very lovely. This restaurant is in Silver Spring, MD., abut 30 miles from our home. Thanks, Jim. I wasn't posting in order to just talk trash. Those were my honest impressions of two local places listed by Duncan Hines. One amendment: inside the Golden Lamb in Lebanon, Ohio (misnamed as "Mt. Lebanon" by Hines) there is a tavern called The Black Horse Tavern. http://www.goldenlamb.com/black-horse-tavern It's casual and probably much more in the spirit of places Duncan Hines visited than the main restaurant. The menu does reflect enormous inflation, however. So if you are redoing a list, you may consider mentioning that. I think this is a neat experiment to try. I just don't expect much, being 80 years after the author made his findings. I also think the dining options have shifted enormously. There's probably many more restaurants per capita today than in the 1930s. And a person pre-1990 was pretty much flying blind to find good restaurants on the road. Not so today. The Golden Lamb is stuffy???? Seriously??? Really??? Well perhaps compared to a greasy spoon, I didn't get that impression at all...Looked like the classic Pre Bruce Bilmes Roadfood Restaurant that we all used to know and love. I'll admit it was a little overpriced and the food was fine, but not mind blowing. It's not a place I would run back to though. Mrs. Knott's Fried Chicken Restaurant just reopened their new and modernized restaurant. It was the charm of the old restaurant that I really loved. That and the chicken. I must make a trip to see how they ruined it. "Here's an outstanding place in a two-acre garden that possesses unusual charm. You dine in the past here--so far as surroundings are concerned. Nothing is changed apparently from the Revolutionary days when it was built. Even the pretty girls who wait on you in Colonial dress seem to have been miraculously preserved from a more leisurely age when dining was a rite not to be passed over casually. It may be crass to speak of food in this genteel atmosphere, but their Virginia ham and fried chicken are the best there are. Mrs. K. superintends the cooking herself, particularly the hot breads and the pies and cakes that have made the place famous. The kitchen is one of the most that I have ever inspected. Try a Planked Steak dinner." In Harrison, Arkansas there is the Hotel Seville. Duncan Hines wrote of it: "Spanish atmosphere. Sometime serve Arkansas rainbow trout, quail and wild turkey in season." It has a restaurant inside today, but probably not one that Hines would recommend. It seems rather average. The Arlington Hotel in Hot Springs, Arkansas was highly recommended by Duncan Hines. I don't think he would have any trouble recommending this place even today, for food or lodging. Duncan Hines wrote, "While the outside appearance is not pretentious, you may get a good breakfast including real coffee and thin, golden brown pancakes at Mason's Pancake Shop." And while the name Mason's has been dropped from the name, The Pancake Shope is still operating 76 years after it opened on Central Avenue in Hot Springs, Arkansas in 1940. Here is the oldest operating restaurant in Arkansas. It's Franke's, which has been around Little Rock since 1919. For a long time they had outlets in other parts of the state. I don't know what they serve now, but in the late 1930s and early 1940s the specialties, according to Duncan Hines, were barbecued lamb and cornbread. My ex-neighbor Jean Francois is executive pastry chef at The Greenbriar. That gets me nothing except something to write about. My other neighbor, Nancy made him some sort of a cake when he lived here and he told her that he liked it. She also believed Trader Joe's sold on April first. I will be visiting the Beaumont Inn on my Kentucky/Indiana trip in August. Hollyhock Hill is a maybe a possibility too, depending on how many windy city folks join me for that part of the trip. wanderingjew - I'd love to know if you know of any that still exist on RI. If you don't have a guide, I could send you a list of names from my book. La Posada in Winslow, Arizona is still going strong. Although I was served grilled corn that was still frozen the other food, the environment, the decor and the train going by out back was a wonderful experience. I'd love to visit again. I've been to all in Louisiana except for Broussard's. I loved them all. Antoninne's was the first restaurant where I experienced a woman in the restroom who's job was to hand me towel's to dry my hands. There was also a tip tray in the bathroom which was very different. I've eaten in many of the rooms at Commander's Palace and don't care for the process of seating you dependent on who you are. ""If the soup was as warm as the wine, if the wine was as old as the turkey, if the turkey had breasts like the maid, it would have been a fine dinner." ~ Duncan Hines"
We ate at Broussard's several years ago only because it was close to our hotel. We were really blown away by the food and the entire experience. Our waiter insisted that it was our anniversary and brought us a complementary Bananas Foster for dessert. My only disappointment on our second visit was that I couldn't get the Berkshire pork chop I had the first time. That was the best pork chop I have ever eaten.